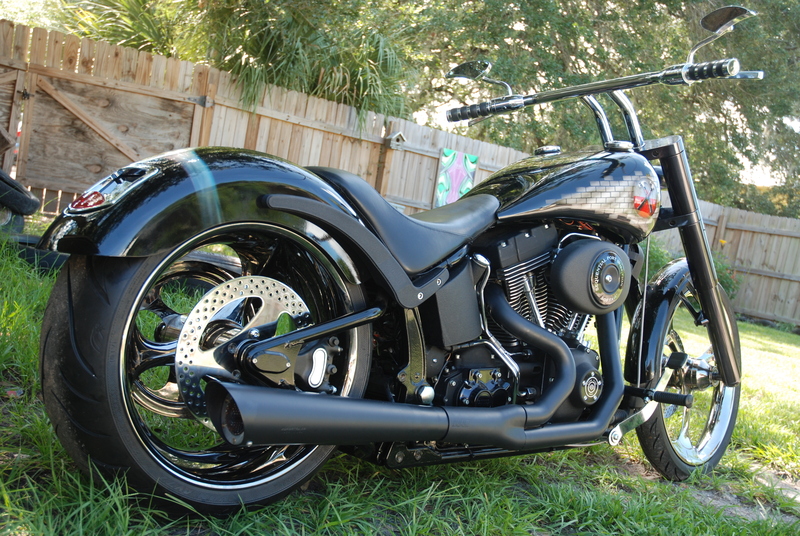 Black Floyd is a Harley Davidson Night Train that Art In Motion customized for Robert in Norway. It features an awesome blacked out look, as well as airbrush art honoring Rock-n-Roll through Pink Floyd and Green Day. When we do this much customizing we recommend that you start with a low mileage used motorcycle like this one that had 2000 miles on it – we shop the auctions nationwide to find the perfect donor for you. Earlier I had a Softtail Custom 96 mod, a very good bike, but I wanted to fit a big rear wheel on this. I have always fancied those big rear wheels. A fantastic bike was for sale in the neighbourhood, but I felt it was too expensive for me to buy. In April 2011 me and my family spend a 14 days holyday in Kissimmee. During this holiday I “accidently” came over Art in Motion on the internet, over places nearby for Harley parts. I got exactly what I needed at Tom Kapp`s workshop, and I felt that I got very good service. Tom checked, and found out it was impossible to find a similar bike and said: But we could make one. I said yes, let`s go for it. Tom sent me a whole lot of links to different parts, like the wheels, front, the Heartland big rear plus more. Also the possibility for for custom paint was mentioned. I was going to get a bike exactly how I wanted it. Tom found the donor bike in California, a perfect 2002 Night Train with only 400 miles on it. While waiting for the bike to arrive from California, all the different parts for the transformation was decided and ordered. A friend helped me to decide the different art I should use, and where they should go. I have been a fan of Pink Floyd for 20 years so it was easy to find the right motives, from The Wall from 1979. Thing`s came into place both in mind and in Tom`s workshop, I received lot`s of pictures for me to follow the transformation. The bike came to Norway early in January 2013, approved by Norwegian vehicle department in early June. I had my first run with it to Swedish Rock Festival 5 – 8 of June, and it was a fantastic ride, nearly 1250 miles. The bike worked fine, and a lot of people stopped to take pictures of both bike and custom paint, not me he he. Yesterday we were on Hamburg Harley festival amongst 70 000 bikes, and could not find anything like the Black Floyd. It`s obviously on of a kind, and i`ll like it to stay that way. Thank’s for your expertise and updates all the way through to make this bike happen. Best regards from Robert – Norway.